(CNN) -- If the last two years are anything to go by, 2012 will once again see every other team and driver in Formula One desperately trying to keep pace with Red Bull. The Austrian-owned marque have clinched back-to-back drivers' and constructors' titles, and in German superstar Sebastian Vettel they boast the sport's youngest double world champion. 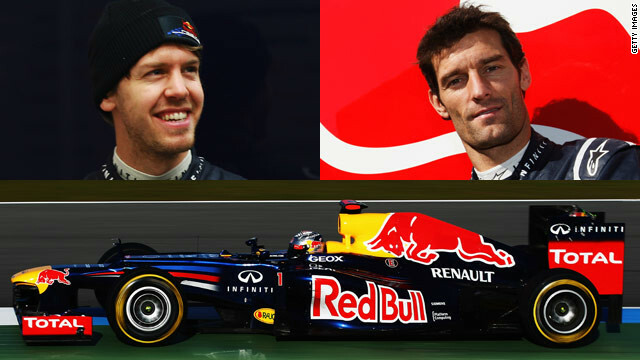 Alongside Vettel will be experienced Australian driver Mark Webber, in addition to the genius of technical chief Adrian Newey -- the brains behind the all-conquering RB7 car. Out of 19 grands prix last season, Red Bull started 18 on pole and took the checkered flag in 12. After finishing 153 points ahead of second-placed McLaren in the constructors' standings, it is clear the 11 other teams have a huge gap to bridge if 2012 is going to be any different -- despite both Vettel and Webber claiming that this year the title race will be a lot closer. The former Toro Rosso driver enters his fourth season with Red Bull seeking to become only the eighth driver to win three world championships. Only Michael Schumacher and 1950s legend Juan Manuel Fangio have won three in a row. Vettel secured his first title after a nailbiting five-driver shootout at the final grand prix of 2010, but his triumph last year was far more comprehensive. He was a huge 122 points ahead of McLaren's second-placed Jenson Button in last year's drivers' standings after claiming 11 grands prix victories. The 24-year-old has already racked up 22 race wins in his career, all but one of which have come in the last three seasons. The 35-year-old spent last season in Vettel's shadow, having to wait until the season-ending Brazilian Grand Prix for his first and only win of the year. Webber did qualify fastest on three occasions, but that figure compares poorly to Vettel's imperious record of 15 pole positions. The former Williams driver signed a contract extension with Red Bull in August 2011, but the deal expires at the end of the forthcoming season. Closing the 134-point gap which existed between him and Vettel in 2011 would help Webber earn a new contract with the Britain-based team.